Yale University and Columbia University, together with the World Economic Forum, have released the 2016 Environmental Performance Index (EPI), which tracks how well countries protect human health and ecosystems. According to their analysis, "nearly every country" has improved their "environmental performance" on 20 different indicators over the past decade, while land and marine ecosystems only continue to decline. Countries in Western Europe and North America, which already have fairly high scores, now focus on incremental improvements, but are still gaining, while even China and India have shown significant improvements from 2006. Still, the problems facing both people and ecosystems are massive. More than 3.5 billion people -- half of the world's population -- live in countries with "unsafe" air quality, and around 8 percent of the global population still lacks access to clean water. On the ecosystems side: a third of all fisheries are "over-exploited" or have simply collapsed, while, in 2014 alone, an area the size of Peru, about 2.5 million square kilometers, was stripped of trees. Only 15.4 percent of terrestrial habitats and 8.4 percent of marine habitats are protected, far less than the amount Harvard biologist E.O. Wilson has called for: 50 percent of the Earth's surface. The world's progress on environmental performance is wildly uneven. For example, the EPI global scorecard shows improvements in access to drinking water. The number of people who lack access to clean water has been cut in half from 960 million in 2000 to 550 million today, even as the population has increased. However, the report also shows corresponding human health failures, namely increasing air pollution. As they argued in 2012, uneven progress is due to different stages of economic development. "As nations become wealthier, particularly in Asia, their governments invest in sanitation infrastructure and fewer people are exposed to unsafe water, leading to fewer deaths from waterborne illnesses. But as countries develop, increased industrial production, shipping, and automotive transportation foul the air, exposing human populations to dangerous airborne compounds." In India, which is rapidly developing, 75 percent of the population is exposed to dangerous air every day. And in China, which has quickly become the second biggest economy on Earth, one in five deaths is attributed to air pollution -- about 4,000 people every day. While air pollution is a critical issue in China and India, it also impacts people far beyond those two developing countries -- some 3.5 billion people, or half the world's population -- live in places where fine particulate matter exceeds World Health Organization (WHO) safe standards. Wealthy Nordic countries continue to lead the rankings, with Finland, Iceland, Sweden, Denmark at the very top, followed by European countries Slovenia, Spain, Portugal, Estonia, Malta, and France. Over the past decade, these countries show a 5-10 percent improvement in environmental performance, with model Finland improving just 3 percent over the decade, perhaps because it has already achieved such high levels of achievement. Finland, the report notes, recently passed a legally-binding resolution to receive 38 percent of their final energy from renewable sources by 2020; currently, the country already gets two-thirds of its electricity from renewable or nuclear power. This year, the USA is in 26th place, a great improvement over 49th place in 2012 and 61st place in 2010, and a 10 percent improvement overall in performance over the past decade. President Obama's administration has made major gains in improving air quality. Over the past decade, the administration has issued new regulations on heavy duty truck fuel efficiency and released new mercury air toxins standards, particulate matter rules, and fuel sulfur rules. President Obama has also stepped up conservation efforts, broadening the world's largest protected marine preserve, the Pacific Remote Islands National Marine Monument, into a zone that now covers 490,000 square miles. The U.S. has done poorly on protecting its forests though, according to the index. Canada is ranked at 25, just one spot above the US. China, the world's second biggest economy, is ranked 109, up from 116th place in 2012. Its performance has improved nearly 13 percent over the past decade -- its air quality and sanitation and waste water treatment efforts have led to gains over the past decade. And, India, the world's most populous country, is in 141st place, slipping from 125th place in 2012, but improving 20 percent over the past decade, largely because of its improvements in sanitation and waste water treatment. The report identifies most-improved countries -- which include Comoros (48 percent), Sao Tome and Principe (38 percent), Egypt (37 percent), Djibouti (36 percent), Timor-Leste (33 percent), Lesotho (32 percent), Tanzania (31 percent) -- but all are below 100 in the rankings, so they start from relatively low points. Among middle-income countries, Ukraine, Dominican Republic, Lebanon, Jordan, Greece, and Croatia have also showed big gains. One of the few criticisms of this heroic analytical effort is the report could better highlight some of the most destructive underlying trends -- namely the unabated destruction of the world's forests, ecosystems essential to all life on earth. A stunning set of statistics: the world has lost 18 million hectares of forest each year since 2000. "The rate of global forest loss has increased in the past 15 years, up 19 percent in the period 2012 to 2014, and 42 percent compared with 2001 to 2004." Forests, as they explain, are threatened everywhere, but most in danger in Brazil, Indonesia, the Mekong Basin in Southeast Asia, and Congo Basin in Sub-Saharan Africa. In 2014 alone, tropical forests lost 9.9 million acres of trees, an area the size of South Korea. 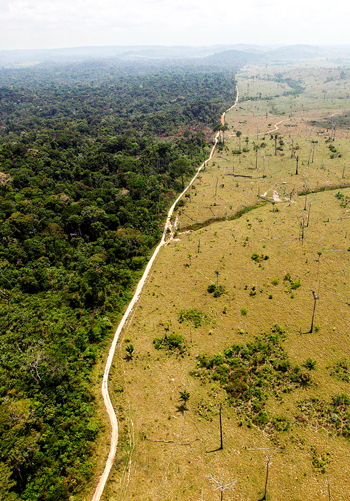 Brazil has made strong pledges to eliminate illegal deforestation by 2030 but deforestation rates rose 16 percent last year. In other parts of the world, there aren't even pledges to slow the destruction, as palm oil plantations and livestock farms replace forest. Towards the end of the 100-plus-page report that accompanies the index, the team from Yale and Columbia return to their core argument, which is humanity is dramatically undervaluing the planet's ecosystem services, and, as a result, slowly destroying its ability to sustain itself. As the authors note, "a recent study estimates that the loss of ecosystem services due to land use changes worldwide was worth between $4.3 and $20.2 trillion a year. These services contribute twice as much to human well-being than the entire gross domestic product" of the world. The authors note that a number of policymakers "already consider global biodiversity loss to be a serious threat to economic growth." These forward-thinking policymakers understand that without forests and essential ecosystems, there is no global economy. The EPI argues the only way forward is to decouple economic growth from the destruction of ecosystems. Natural accounting, which measures and includes the value of ecosystem services, must become the norm among governments and the private sector. Without the incorporation of the real economic value of the environment, it will be impossible for policymakers to make decisions about sustainable natural resource use. Natural accounting can be used to make the case for conservation and also restoration -- what's needed if we are to have a sustainable future.